Our boat is a blur of activity. We are sleeping in Tampa, at the RiverHawk Marine boatyard, in a Travel lift sling, on blocks, up a ladder, in a bed – with a view of the river. Strangely, we have met someone else who is also living in the boatyard. 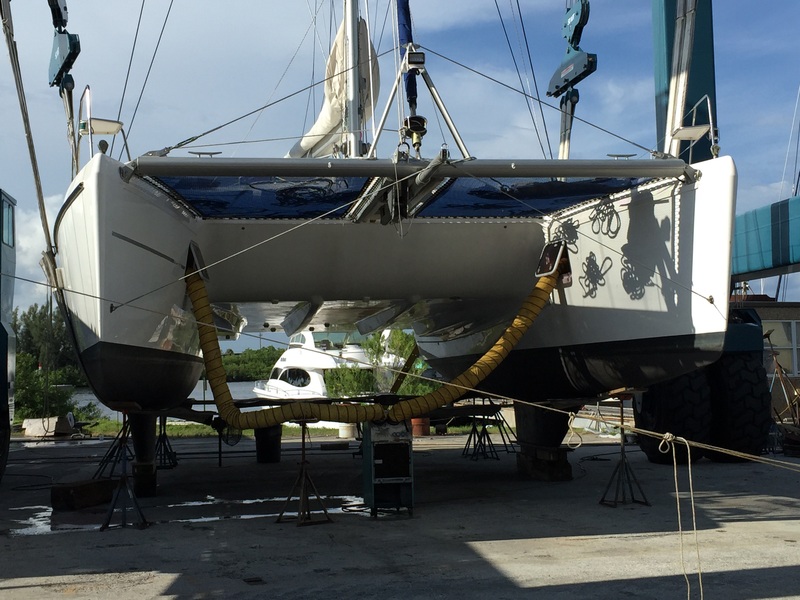 His name is Johnny Spector – I love his name – and, he has been living in the boatyard for a year – overseeing an extensive refit of an 84 ft motorboat. 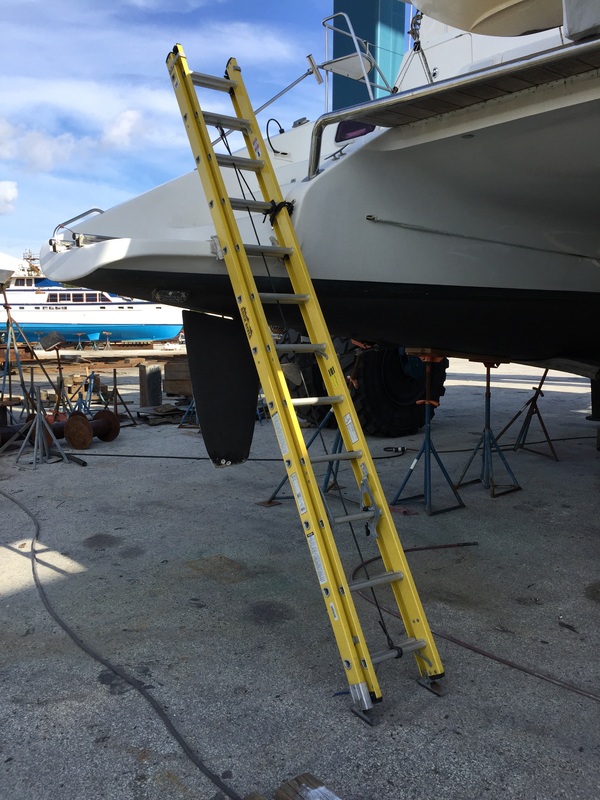 We access our boat by using a 24 foot ladder. Ladder to our boat – provides a river view. We can’t use the toilets, showers, or taps onboard. Understandably, Frank Hohenhouse, the boatyard owner, doesn’t want these items draining overboard. We used the underwater LED lights last night to help illuminate our path to the boatyard bathroom. It’s the strangest place I’ve ever slept. But I do enjoy this rustic living. It’s a bit like sleeping in a treehouse. Yesterday, Frank rigged us up with air conditioning. The photo below shows the two large yellow pipes that are providing us with cool air, which is essential in this climate. Air conditioning is provided by two large, yellow pipes that are connected to a cooling unit. As for the refit – it is very busy here. We are replacing various thru-hull fittings. 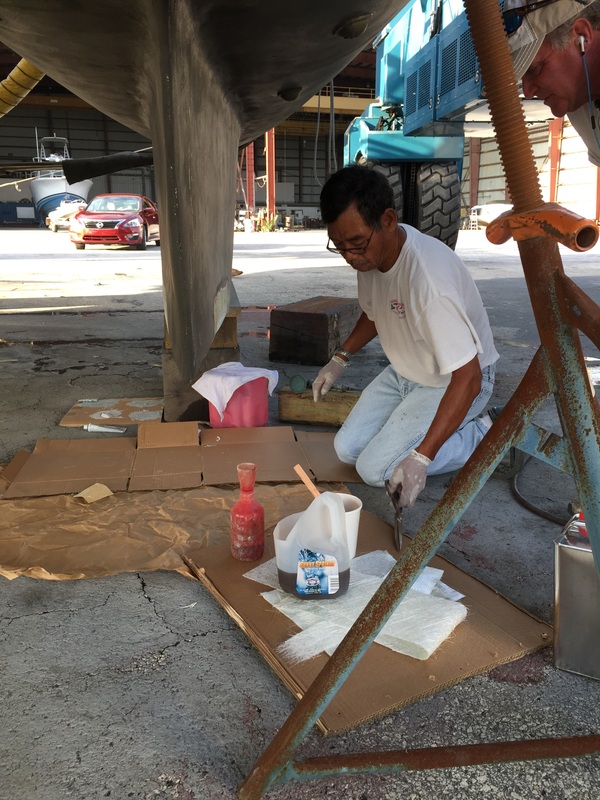 Someone was using fiberglass on our starboard keel today. 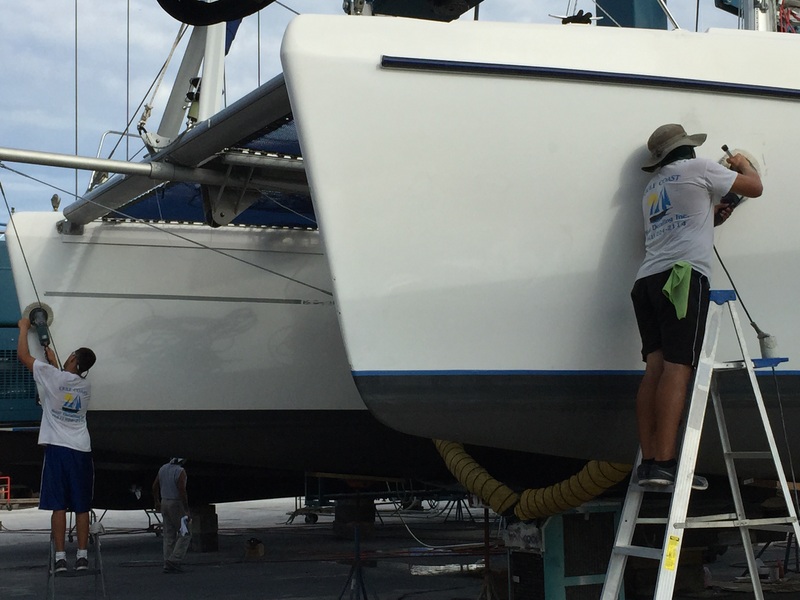 And, some workers are buffing our boat in preparation for the artwork. Here are a couple of pictures to give you a sense of the activity. 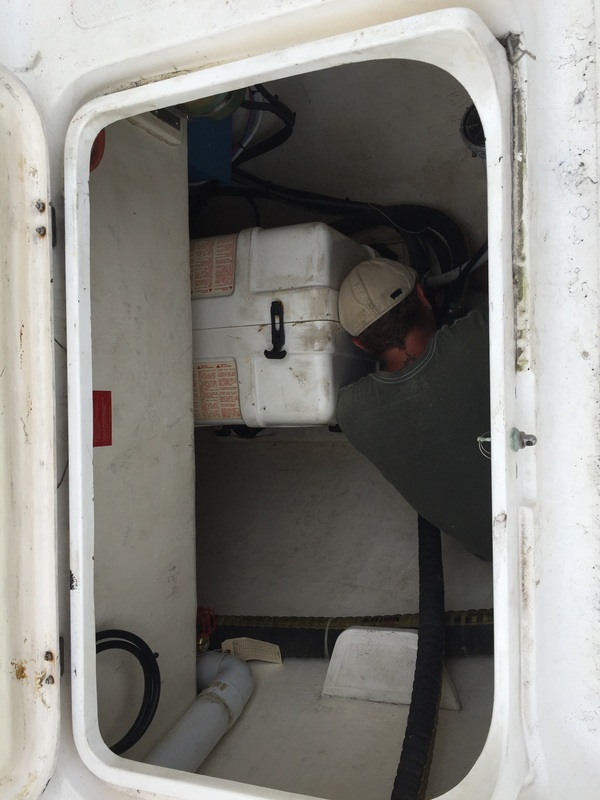 Ryan working in a locker on the aft deck of the SV Aphrodite. Before I realized he was inside, I almost closed the lid on him. And just in case you thought that my husband, Rick and I are cooling our heels at a Starbucks while all this is happening – we are not. Here is a picture of the saloon interior. Saloon – currently, a collection area for ‘stuff’ – where we are emptying all of the lockers and storage spaces to clean and organize. The saloon cushions have been ripped out. We are vacuuming fiberglass dust. The photo doesn’t convey the smell of acetone in the air, or the true sense of clutter. We are working hard. Soon it will be organized and inviting. It’s raining here now. and although it’s mid afternoon, all of the workers have gone home. I need to get back to our treehouse. We are in Winnipeg, following your adventure with rapt attention! 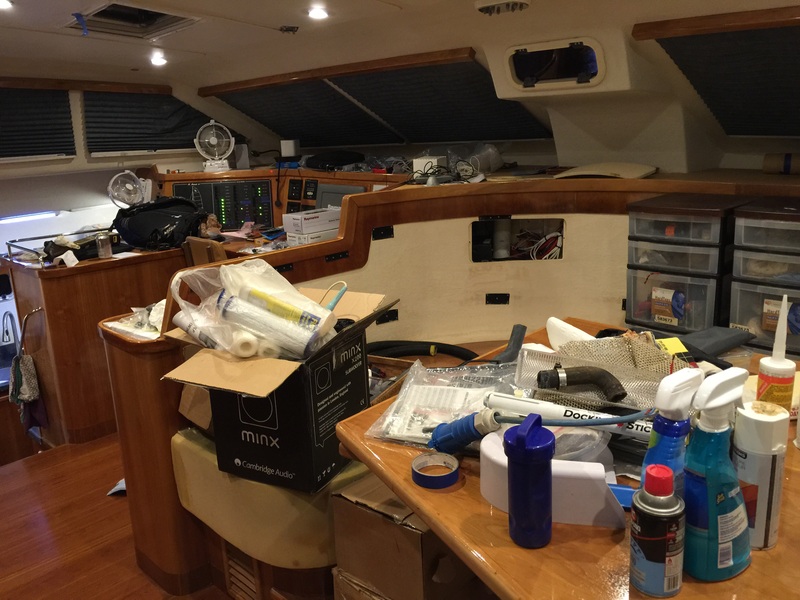 Found your blog as we were preparing for our first night aboard our new (and first) sailboat so I can hardly imagine your excitement and perhaps trepidation as you prepare. We were leaving for 20 hours, not months! Thanks for letting us all learn vicariously through your blog.